Mr Shah also slammed the ruling BJD over corruption, and asserted that those involved in chit fund scam will be jailed within 90 days, if the party is voted to power in Odisha. Congress chief Rahul Gandhi is not capable of countering Pakistan-sponsored terrorism and the country can be safe only under Narendra Modi's leadership, he claimed. "Can Rahul baba protect India? He and his party have tried to defame the country across the world by raising the bogey of Hindu terror," Mr Shah said. The term "Hindu terror" was used by Congress leaders after the Samjhauta Express explosion in 2007 and the Malegaon mosque blast the next year. Addressing election meetings in Odisha's Dhenkanal and Baramba, the BJP chief said many innocent sadhus had been jailed in the Samjhauta Express blast case as the Congress sought to raise the bogey of Hindu terror. However, the court not only acquitted all the accused including Swami Aseemananda in the case but also made it clear that the saffron terror tag was "imaginary," he said. Sixty-eight people, mostly Pakistan national, were charred to death in blasts in two coaches of the Samjhauta Express near Panipat on February 18, 2007. In order to "punish" the Congress for raising the Hindu terror bogey, BJP has pitted Sadhvi Pragya Singh Thakur, an accused in the Malegaon blast case, against Digvijay Singh, whose brainchild is the bogey of saffron terror, from Bhopal Lok Sabha seat, Mr Shah said. Six people were killed and over 100 injured when an explosive device strapped on a motorcycle went off near a mosque at Malegaon in Maharashtra on September 29, 2008. Stating that the Congress cannot protect the country with such a mindset, the BJP president said Prime Minister Narendra Modi, on the other hand, has been giving top priority to national security. 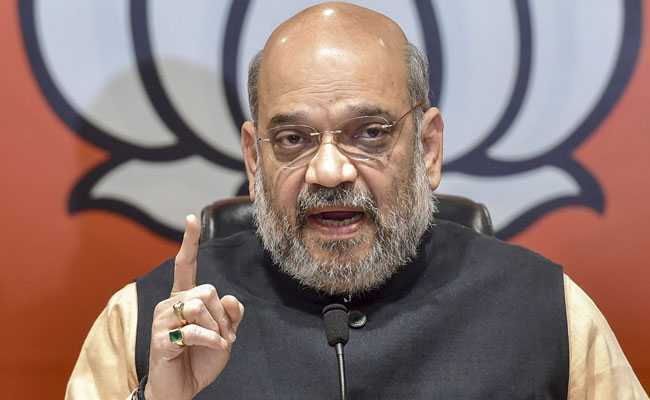 The air strike carried out on terror camps right inside Pakistan after the Pulwama attack amply demonstrated India's strength and power, Mr Shah said. Hitting out at Congress, the BJP chief said Mr Gandhi's ''Guru'' Sam Pitroda advocated talks in the aftermath of Pulwama terror attack instead of seeking strong action. With Assembly election in Odisha also being held along with Lok Sabha polls, the BJP president came down heavily on the Naveen Patnaik-led BJD Government and said the state was hit by rampant corruption in the form of chit fund, mining other scams. Alleging that many BJD leaders were involved in the multi-crore chit fund scam in which thousands of poor investors were duped, Mr Shah said, "Once the BJP comes to power in Odisha, all those involved in the chit fund scam will be put behind the bar within 90 days of forming government." Mounting a scathing attack on the BJD government, Mr Shah said the M B Shah Commission had found that mines were allotted and precious minerals handed over at throw-away prices in the state but the mining mafia were protected by BJD. If the BJP comes to power, those involved in the mining scam will be sent to jail, too, Mr Shah said. "Odisha is facing Babu Raj during BJD dispensation as bureaucrats are calling the shots. After coming to power in the state, BJP government will take quick steps to end this and ensure that democracy in its true form prevails," the BJP president asserted. If the BJP is voted to power in the state, drinking water facility, pucca houses and electricity will be made available to each and everyone by 2022, he said. The BJP chief also hit out at Mr Patnaik for refusing to implement Ayushman Bharat and said it deprived a large number of people of the benefits of the health insurance scheme.